If you're a vegetarian, we can't help you. Let's be real, half the reason we go out to vote every three to four years is for the sausage sizzle. Luckily, the champions at Democracy Sausage have put together a map of sausage sizzle stalls throughout Victoria for the 2018 state election. If you're in need of a post-poll feed, we've got you covered. More than 150 stalls have been listed on the map so far, with many also offering cakes in addition to the humble snag. Rest assured your money will be worth it, as stalls are often fundraising for good causes, such as public school projects or community organisations. Brunswick, Coburg and Preston voters are looking like they'll be in luck, according to the sausage-to-suburb density, and residents in the south-east aren't too far behind. For voters in the CBD, it might be worth making the trek outwards if you're looking to get your hands on some sizzling goodness. Over on the west, it's looking pretty grim. Only one or two sausage suppliers have been identified in the Footscray area and the surrounding 'burbs aren't promising much either. Here's hoping the west sort out this sausage drought before tomorrow. 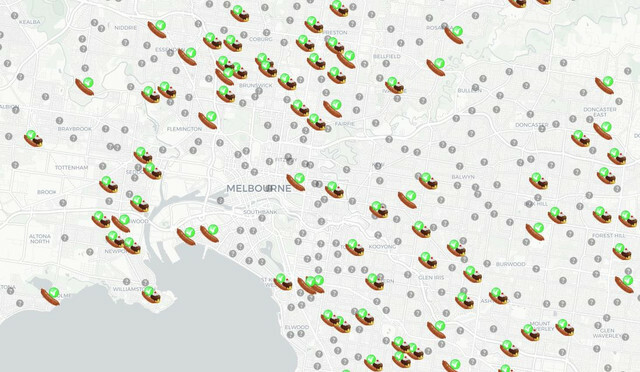 The sausage sizzle map from Democracy Sausage is crowdsourced, meaning Melbournians are encouraged to become informed citizens and let the website managers know about any spots they might've missed. It's looking like it's going to be a chilly one tomorrow, so rug up before you snag up.